I’ve had these shoes for many years, and can recommend them confidently. They’ve gotten me through a Pecos river canoe trip, multiple Guadalupe river excursions, and most recently, a hike along Barton Creek in Austin. I’ve categorized them as “Wardrobe Staples,” as they are comfortable and practical for any excursion involving water. Like a tennis shoe, they have tough rubber soles and laces, but unlike tennis shoes, they are mesh, allowing water to flow through the shoe but keeping out pebbles. The mesh allows them to dry quickly. The laces are a cable with a drawstring and lock feature, which you simply cinch down until snug. Wearing a full coverage shoe like this as opposed to Chaco or Teva sandals protects the top of your feet. I don’t know about you, but I’d rather not have unknown objects brushing the top of my feet as I wade through a river. The most handy feature for overnight canoe/kayak expeditions is the back of the shoe, which is made to be folded down, turning the shoe into a slip-on. I found this handy when camping alongside the Pecos river several years ago and needing to go in and out of my tent regularly. These are not meant to be worn with socks. My only complaint was that after hiking several miles in these yesterday and wading in the creek, I had a blister on the back of my foot. But I assume that can be expected when hiking with wet feet and no socks for several miles. 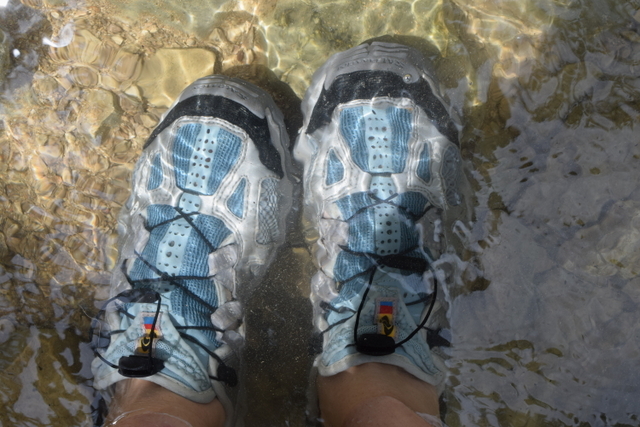 No Replies to "Wardrobe Staple: My Favorite Water Shoes"